The family owned company BMB is specialized in the distribution of natural stone for more than over half a century. The various blocks of natural stone are sourced from all over the world and then processed into slabs by BMB. The company also has a wide selection of ceramic and quartz slabs. Members of the public as well as architects and stonemasons are welcome. The slabs are cut into a finished product by stonemasons: kitchen worktops, vanities, bath surrounds, wet rooms, etc. At BMB you will find the perfect material match for any desired application. BMB attaches great importance to delivering high quality products. All materials have to meet stringent requirements and are thoroughly inspected by our own experts. Quartz composite is supplied by the Belgian market leader Diresco and by Technistone. The brand of sintered surfaces or ceramic slabs, that we carry, is Neolith by TheSize. BMB was established in 1983 by Marcel Delmulle as a wholesale and marble cutting business. Prior to this, the company existed for over 20 years as a marble block cutting department within the Danilith construction company. Shortly afterwards BMB also invested in gang saws and polishing lines. In 1987, the cutting of granite blocks was added to the business activities creating an explosive growth in turnover. Over time, sales activities expanded from Belgium to the Netherlands, France, Luxemburg and the United Kingdom. The increasing demand for natural stone made it necessary to create more stockholding capacity so that BMB could offer a range as wide as possible. In 2005, the cutting of granite blocks was relocated to a new production factory in Doornik. 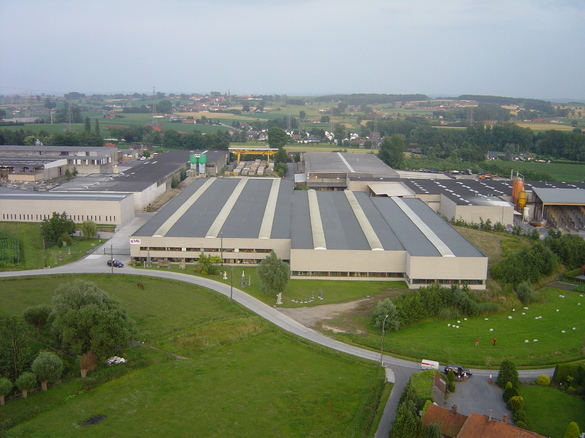 The mother site in Wortegem-Petegem now mainly serves as warehouse. BMB is still cutting blocks of various materials into slabs, but the main activity is the buying and selling of slabs to stonemasons. BMB has also set up branches in France and the United Kingdom. BMB has many years of experience within the natural stone business and has the know-how that was passed on from generation to generation. The current directors are Hans and Rik Delmulle, two sons of Marcel. In the meantime, BMB has 55.000m² of warehousing of which 35.000 is covered and has the most advanced overhead gantries. At BMB, you can rely on getting the best quality and a good customer service. The quick deliveries are guaranteed by our 7 trucks. BMB also keeps on investing in innovative technologies. We take into account an increased demand for special marbles and offer our clients a customized solution. With the Stonebox, a unique reception area, BMB can also co-operate more closely with architects and interior designers.